The first time ever in the summer and the first time non-smoking, the 11th Annual Canadian National 8 Ball Championships were held July 12 – 15th, 2006 at the DoubleTree International Plaza Hotel in Toronto, Ontario. With representation once again from from coast to coast, we congratulate all the new Champions on their hard won Titles which they’ll all have the opportunity to defend next year, courtesy of Return Trip CCS Added Prizes. Also, for the first time, it included Junior Singles whose play was amazing. If we were to choose an ‘All Star’ at this year’s Canadians, it would have to go to Denise Belanger of Toronto ON. After saying she felt she was ‘struggling’, she goes on to finish 2nd in the Womens A Singles, wins the Scotch Doubles and her team ‘ Fully Loaded’ also wins the A. Not done yet. She also wins the Terminator Break contest beating out all the guys! Her Scotch Doubles partner wasn’t too shabby either. Louis Fazekas , from Chelmsford ON, also finished 4th in Mens A Singles and was on the team Lamothe’s Janitorial who won the Mens A. In the A Advanced division, Lamothe’s Janitorial (Captain-Frank Servant, Don Brunelle, Fern Loyer, Joel St. Germain, Louis Fazekas) from Chelsmford ON showed their 2002 win was no fluke. It was no easy road as they bested Midnight Express from Toronto, Molson Canadians (4 time Atlantic Champions) from Halifax NS and Smokin Chicos (2005 National Champions) from Windsor ON before losing to The Rock (3 time National Champions) from Toronto ON in the A Final. After getting by the very strong Dicken’s Cider from Newmarket ON, this time it was all Lamothe’s Janitorial in the Finals in 2 sets over The Rock (Captain-Vince McIntyre, Al Porter, Al Logan, Brant Hillman, Chris Pegg and Harry Chigarras). The B Open was won by Get In The Hole (Captain Keith Dusome,Jeremy Nazareth, Chris Harvision, Dave Kirby, Al Holmes, Mike Patrowicz) from Newmarket ON and the C Standard was won by Colby’s Bounty Hunters (Captain John Peter O’Dowd, Mike Anderson, Paul Sullivan, Gil Botelho, Jordan Rowe,Tom Millette, Adam Noseworthy, Jason Britton, Jim Campbell) from Cambridge ON. In the A Advanced division, Fully Loaded (Captain Denise Belanger, Krista Walsh, India Slaughter, Heather Tomkins, Judy Walsh) from Toronto ON went unbeaten with wins over Step Aside (2006 Ontario Open Champions) from Toronto, All In 545 from Brampton ON, Break N Run (2005 National Champions) from Toronto ON before meeting Delicious (Captain Danielle Morris, Jane Adams, Sheryl Richmond, Alicia Frampton, Elizabeth Kishimoto, Penny Devos) from Burlington ON. The B Open was won by Stacked Racks (Captain Sue Sepp, Sharlene Watkinson, Dawn Craigie, Lorraine Smith, Sharon Gibson, Veronica St. Jean, Kelly Josiak) from Brampton ON. In the A Advanced division, 20 year old Jason Klatt of Winnipeg MB went the distance with wins over Louis Fazekas (who came back to finish 4th), Pat Briand (who came back to finish 3rd), Rob Brandenburg (2004 Open Champion), Derrick Claus (2006 Ontario Champion) before losing to Dave Martin (2005 National Champion) from Calgary AB. Jason regrouped with wins over Pat Briand in the B Final and Dave Martin in 2 sets in the Final. Well done Jason but kudos also to Dave Martin who has now been in the Finals for 3 straight years! The B Open was won by Earl Hill from Oshweken ON and the C Standard was won by Maurice Gaudet from Charlottetown PEI. In the A Advanced, the Finals were a re-match. In the 2006 Ontarios, it was Denise Belanger winning out over Naomi Williams. Not this time. Naomi Williams of Toronto ON went all the way with wins over Christine Muise (2004 Atlantic Champion), Adina Black (Member Island Girls 2002 Vegas Open Champions), Grace Nakamura (former Pro), Carrie Dwyer (2005 National Runner Up) and finally Denise Belanger, who remarkably has finished in the top 4 in every Canadian Championship since 1998. Well done Naomi. The B Open was won by Zabrina Wellman from St.Catherines ON. In the 18 & Under, It was 6’2” Paul Everette of Eskasoni NS who finished first over Spencer LeClair from Cambridge, Ontario. In the 14 & Under it was Pahdahsung Shognosh of Wallaceburg ON who won out over Jeff Robson of Niagara Falls ON. All the Juniors received Prizes courtesy of the CCS and all the Booth Sponsors who were very generous. Special thanks to Cliff Thorburn (Hall Of Famer and Canada’s living snooker legend) who put on a special show for the Juniors. In Scotch Doubles, it was Louis Fazekas and Denise Belanger who won out over Pat Briand and Grace Nakamura to take the top cash and the Falcon Cues. The Canadian Cue Sport Association wishes to thank the DoubleTree International Plaza Hotel for hosting us once again, Hi Country Promotions of Las Vegas for the Valley Tables and the usual stellar Tournament Direction by Gary Benson himself, the ACS certified Referee Crew headed by Ron Zech from Chicago and all the Sponsors – Labatt’s Lite, Falcon Cues, Terminator Cues, Don Broos Cue Services, Hot Shots, Zimy Billiards, Q’s 4 Less, Predator – Grace Nakamura and BDR Transfers. 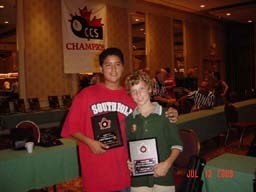 The 2007 CCS Canadian National 8 Ball Championships will be held on Easter Weekend April 4-7th at the Doubletree International Plaza Hotel in Toronto ON. 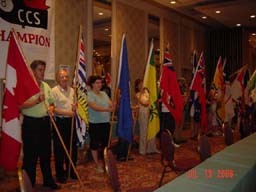 For more information, visit www.cdnqsport.com or call toll free (888) 278-4155.